A small detail which impressed me a lot (besides the great graphics in Fallout 3) is how they did their worn edges. If you look at it from the very near, you can see, that they have a really low poly geometry and two textures on it: the “smooth” stone and the broken edge. And to hide the hard transition between them – or let’s say – to create a nice transition, they placed these normal mapped holes. I investigated the stuff a bit and for anyone who’s interested. 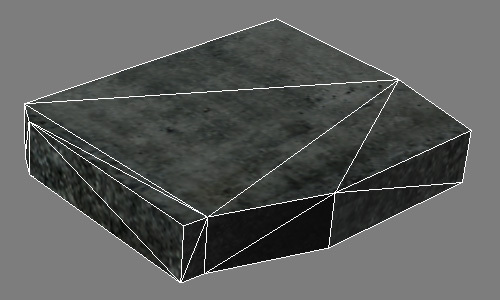 Here’s a wireframe of the stone. That’s important, because i thought, maybe they did a additonal geometry layer bended around the edges. More about this, at the bottom of this article. Further i checked out the textures of the edges. 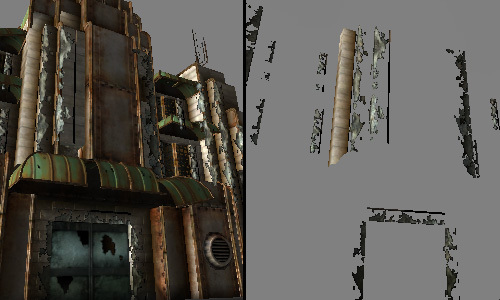 Interesting to say, that Fallout uses half the size of the diffuse map for their normal maps. That’s why in the next image the resolution of diffuse-/normal map is different. 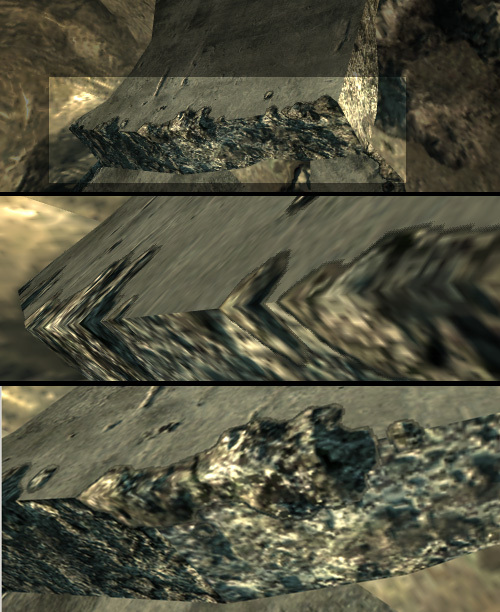 Also I marked which part of the texture is visible in my screenshot. By the way, they save their specular map into the alpha channel of the normal map. In the case of these decals, the specular is totally white. I wonder why they just don’t add an alpha channel then. Normally when a texture doesn’t hold a alpha channel, the return value is 1.0 which means “white”. But I’m sure there is some good point i just can’t see. Let’s talk about the decals. Throttlekitty mentioned that they use decals in a combination with parallax mapping. About the last point I’m not sure, because normally you need a height map for parallax mapping (in addition to the normal map, at least what this article says) and this doesn’t seem the case. But wichenroder gave me this very interesting link about the Cry Engine which explains this stuff. Falk mentioned something: maybe they place the decals in their editor and save this as prefab. Then the level designer could use the prefabs and the decal data is stored wherever. BUT today i talked to a guy at Crytek where another guy (really, at Crytek works another guy??) works which worked at Bethesda in the past. And he (the first mentioned guy) told me, that they (Bethesda) does it exactly the same way like it is in the Cryengine (article mentioned above). OK…maybe i should checkout the NIF tools and maybe there i can see some extra geometry. No, i didn’t painted some black on the texture. I just disabled Alpha1/Alphatest and this is the result. It’s maybe not a proof but a hint that they used extra geomtery for the stuff. This entry was posted in Game Art Tricks and tagged Fallout 3 on 21. January 2013 by Simon. Fallout titles are really huge and use such decals everywhere. 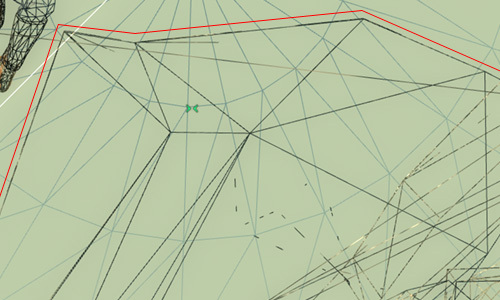 The process described by Crytek doc demands some precious time on each asset. Do you know if they used some sort of script to accelerate the creation of this effect? BTW: I’m really addicted to your site. Congrats! That’s a good question but I really don’t know :,( I’d expect that it’s handmade but yeah, maybe they have a nice script for optimizing the workflow..
Also, about the normal map’s alpha channel: Yes, Bethesda games use the alpha channel as the specular map, and more opaque means more glossiness, but in Oblivion and Fallout 3 (but not for most of the textures in Skyrim and none in the Skyrim Special Edition), if the texture does not have an alpha channel, this is interpreted as “no glossiness”. Otherwise you would need a completely transparent alpha channel to achieve this. 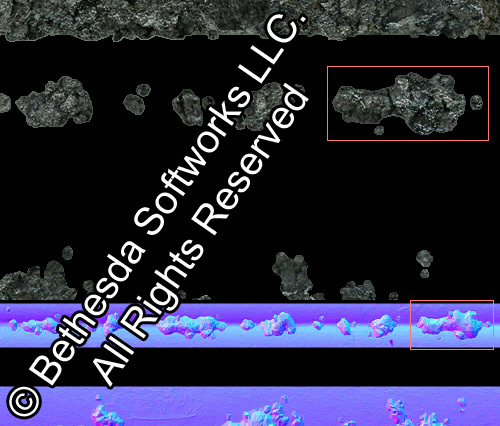 However, textures with an alpha channel (e.g. DXT5 compression) are twice as large as textures without one (e.g. DXT1), so the reason was probably just to save space. DXT1 can have a 1-bit alpha channel, but I haven’t seen this used in normal maps. They seem to have changed this in their newer games, beginning with Skyrim, where this only applies to some textures (mainly terrain), but I suspect they got rid of it completely in Fallout 4, as they apparently did for the Skyrim Special Edition. By the way, this blog is awesome, I have just discovered it yesterday, but I’ve already learned some amazing stuff. I will certainly keep an eye on it, or two. Twaddle, through and through. Unresearched garbage.